Flat Rate – A flat rate is a single dollar amount that every business in the jurisdiction must pay each period for the privilege of operating there. Business Type – Many areas charge different fees depending on the type of business. Certain business types may pay fees much larger than other types. Number of Employees – A business may be charged by the number of workers it employs. Commonly, professional employees such as doctors, nurses, and psychiatrists will warrant higher fees than clerks and other non-professional employees. Gross Receipts/Net Profits – Some jurisdictions charge businesses based on the Gross Sales or Net Profits they earn during the license term. The specific tax rate might be the same across the board or it may vary depending on the type of business and/or the actual dollar amount that a business brings in. Value of Inventory – For retail establishments, it is not uncommon to pay a business license fee based on the end-of-term dollar value of their inventory. Size of Establishment – Brick-and-mortar establishments like restaurants and hotels may pay fees based on the square footage of their building, the number of patrons that can be seated at a given time, or the number of beds or rooms that fill the structure. Number of Vehicles – For businesses that depend on transportation (taxi services, delivery companies, etc. ), a fee may be levied based on the number of vehicles the business uses. 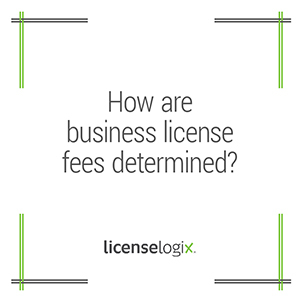 Let the experts at LicenseLogix simplify the complexities of multiple business license fees. Live chat with our license professionals or call 1-800-292-0909 today.